"Manage your relationships well and your business will go well. Because what, after all, is business, but a relationship with some dollar signs attached?" Samantha Sterling sat next to her mother in the first row of Icicle Falls Community Church and fought back the urge to jump up, run to the front of the sanctuary, grab her stepfather, Waldo, by the neck and throttle him. She didn't, for two reasons. One, a girl didn't do things like that in church. Still, she could have overcome her reservations if not for the second reason - God had already taken Waldo out. Waldo was as dead as roadkill on Highway 2. In addition to a daughter from his first marriage, he'd left behind his grieving wife, Muriel, his three stepdaughters, Samantha, Cecily and Bailey, and the family business, which was nearly as dead as Waldo. Sweet Dreams Chocolates had been healthy when Samantha's father was alive. The company had been started by her great-grandmother Rose and had slowly but steadily grown under his leadership - one bit, happy family to mirror the happy family who were living off its profits. All three sisters had spent their summers working at Sweet Dreams. All three had it drummed into them from an early age that this business was the source of both the family's income and honor (not to mention chocolate), but it was Samantha who had fallen in love with it. Of the three girls she was the one who stayed and she was the heir apparent. But then her father had died and everything came to a half. Samantha lost the man she and her sisters idolized and her mother lost her way. Muriel left it to Samantha and the bookkeeper Lizzy to keep the company running on autopilot while first she mourned and then later searched for a new husband. Enter Waldo Wittman, a tall, gray-haired widower recently retired, encouraged to do so by his company which was downsizing. (Now, looking back, Samantha suspected there were other reasons Waldo had been turned loose.) He was wanting to get way from the rat race. With its mountain views, its proximity to Eastern Washington wine country, its small town friendliness and its attractive widow, Waldo decided Icicle Falls would fit the bill. And Muriel decided the same about Waldo. So, after a year and a half of widowhood, she got a new man. And now here he was, at the front of the church, stretched out in his favorite - expensive! - gray suit. Sweet, velvet Waldo… the money eater. Oh, Waldo, how could everything have gone so crazy wrong so fast? It was early January, the beginning of a new year. And what a nightmare year it was promising to be, all thanks to Mom making her new husband president of their family owned business. She'd left Samantha VP in charge of marketing, much good that had done. Now Samantha was VP in charge of disaster and she could hardly sit still thinking of the mess waiting for her back at the office. "You're fidgeting," whispered her sister Cecily, who was sitting next to her. Fidgeting at a funeral probably wasn't good but it was an improvement over standing up, pulling her hair and shrieking like a madwoman. Why, oh why hadn't Mom and Dad done what needed to be done to make sure that if something happened to Dad the business passed into competent hands? Then Mom could have skipped happily off into newlywed bliss, nor harm no foul. No one had expected her to remain alone forever. She was only in her fifties when Dad died and she didn't function well alone. When Waldo came on the scene she came back to life, and Samantha had been happy for her. He was fun and charming and both she and her sisters gave him a hearty thumbs up. Why not? He'd brought back Mom's smile. At first everyone got along great. Like Samantha, he'd been a shutter bug and they'd enjoyed talking photography. Her favorite joke when she'd come by the house to talk business with Mom (or try anyway) was to ask, "Where's Waldo?" But once Mom dropped him on the company like a bomb Samantha didn't have to ask. She knew where Waldo was. He was at the office, in over his head and making her crazy. She ground her teeth as she mentally tallied how much money he'd squandered: new business cards with his name on them, new stationery, new equipment they hadn't needed, a fancy phone system they couldn't afford that he been talked into buying from a slick-tongued sales rep. How could a businessman be so bad at business! Of course, he'd convinced both himself and Mom that every purchase was necessary and Samantha hadn't had the veto power to stop them. That had been just the beginning. Six months ago their profits sank and they started having trouble paying their suppliers. Waldo cut back on production, which then affected their ability to fill orders, and Lizzy their bookkeeper began looking like she'd been invited to dinner with the Grim Reaper. "We're behind with our IRS quarterlies," she informed Samantha. "And that's not all." She showed Samantha expenditures on the company credit card that made no sense. A gun. Ammunition. Cases and cases of bottled water, enough to keep the whole town hydrated. Waldo was a financial locust, devouring the company. "And I know if Waldo could speak to us now he'd say, 'Thank God for a life well-lived,'" Pastor Jim said. Her mother let out a sob and Samantha felt a pang of guilt. She should be crying, too. She'd liked Waldo. He'd been a man with a big hear and a big appetite for life. "We know he'll be missed," Pastor Jim said, and Cecily laid a comforting hand on Mom's arm, which gave Mom permission to start crying in earnest. "Poor Mom," whispered Bailey, who was sitting on the other side of Samantha. Losing two husbands - talk about a double whammy. Mom had not only loved both her husbands, she'd loved being married. She had no head for business (which probably had a lot to do with why Grandpa had been perfectly happy to let Dad run Sweet Dreams), but she had a gift for relationships. She'd even had a couple of relationship books published with a small publisher and before Waldo died she'd been about to start a new book: Secrets of a Happy Remarriage. Samantha only hoped that now Mom would turn her attention to learning how to have a happy life … with no marriage. At least no marriage until they could get the business of the critical care list and Samantha was put officially in charge. The sooner the better. Her first order of business would be to rehire Lizzy, who Waldo had let go in a misbegotten attempt to economize. She only hoped Lizzy would come back and help her sort through this tangle. She heaved a sigh. Here her mother was grieving and all she could think about was saving the family business. What was wrong with her? Did she have nothing but a calculator for a heart? "Now I'd like to give the rest of you a chance to say something nice about Waldo," said Pastor Jim. He made me nuts probably didn't qualify. Samantha stayed seated. Lots of other people were happy to oblige though. "He was the most generous man I ever met," said Maria Gomez, his regular waitress at Zelda's. "He gave me two hundred dollars to get my car fixed. Just like that. Said not to worry about paying him back." Samantha pressed her lips firmly together and envisioned hundred dollar bills with wings flying away, circling ever upward and off toward Sleeping Lady Mountain. You do have a calculator for a heart. Here people were talking about how nice Waldo had been, and all she could think about was money. She was a terrible person, a terrible, terrible person. She hadn't always been a terrible person. Had she? A tear slipped from a corner of her eye. Ed York, owner of D-Vine Wines, stood up. "I can still remember sitting with Waldo out on his deck, looking at the mountains, sharing a bottle of wine, and him saying, 'You know, Ed, it doesn't get any better than this.' That Waldo, he sure knew how to enjoy life." While everyone around him was pulling out their hair. "He was a dear soul," said old Mrs. Nilsen. "Just last month he stopped in the freezing cold to change my tire when I had a flat on Highway 2." On and on the praise went. Good old, wonderful Waldo. Everyone here would miss him … except his rotten, ungrateful, Scrooge-in-drag, calculator-for-a-heart stepdaughter. She was pathetic. Another tear sneaked out a corner of her eye and trickled down her cheek. Pastor Jim finally called a halt to the festivities and the party made its way under cloudy skies to Festival Hall where everyone could mingle, sing Waldo's praises further, and devour cold cuts and potato salad. Inside, the three sisters smiled and commiserated. Waldo's brother and his daughter Wanda had flown in from the East Coast. Taking in the woman's red eyes as she approached, Samantha managed to find empathy in that swirl of guilt and resentment and frustration she was experiencing. "I'm sorry we're having to see each other again in such sad circumstances," Wanda said. "So are we," said Cecily. "I'm sorry for you loss," Samantha added. And she was. She knew how horrible it was to lose a father and she wouldn't wish that experience on her worst enemy. Wanda dabbed at her eyes with a soggy tissue. "I just can't believe he's gone. He was the best father. And he was always so positive, so upbeat." So clueless. "I wish we could turn back the clock," Samantha said. Wanda sniffed and nodded. "You were all so good to him." Samantha couldn't think of anything to say to that. She hardly wanted to confess that the last few months she'd been anything but good. Cecily stepped into the gap. "He was a nice man." True. He was just a bad businessman. "He sure loved Muriel," Wanda said. "He was so lonely after mother died. Muriel gave him a new lease on life." "And I don't know what her life would have been like without him," Samantha said. "I think Muriel would like to hear that, Wanda," said Waldo's brother Walter, and led their long distance stepsister away. "I need a drink," Samantha decided. "Good idea," said Bailey, and they all drifted over to the punch bowl. Samantha really wasn't much of a drinker but a good stiff belt sure seemed to help a lot of movie characters through stressful moments, and right about now she was willing to give it a try. "I wish this was spiked," she muttered. Bailey looked across the room at their mother. "I feel so bad for Mom." Muriel Sterling-Wittman sat on a folding chair framed by the weak winter light coming through the window behind her, a beautiful, tragic figure starting the new year alone. Her basic black dress discreetly draped her Betty Boop curves and her hair was still the same shiny chestnut it had been when Samantha was a girl thanks to the geniuses at Sleeping Lady Salon. The green eyes Waldo once raved over were bloodshot from crying, but still looked lovely thanks to lashes thick with waterproof mascara. Half the men in the room were hovering with tissues just in case she found herself in need. "Well, at least we won't have to worry about her being lonely," said Bailey. She was the spitting image of their mother and the most like her as well - sweet, positive, and naive. Cecily gave a snort. "Much good any of those men will do her. They're all married." "He's got the hots for Pat over at the bookstore," Samantha said and mentally added, Thank God. "Arnie's not married," Bailey said. "Neither is Mayor Stone. Or Waldo's brother. Wouldn't it be sweet if-?" Samantha cut her off. "Let's not even put that thought out in the universe." All they needed was another man coming along and convincing Mom that the third time would be the charm. "Look at them. Waldo is barely gone and they're already circling around her like some old guy version of The Bachelor," Cecily said in disgust. "Men." "You know, for a matchmaker you sure have a sucky attitude," Bailey observed. "How do you think I got it?" retorted Cecily. "I don't know how you manage to stay in business," Bailey said in disgust. "By staying superficial," Cecily said with a wicked grin. Cecily was the only blonde in the family and she was the prettiest of them all with perfect features and the longest legs. Samantha had been cute with her red hair and freckles, but it was Cecily the boys drooled over. Still, in spite of her good looks, Cupid had never been kind to her. So far she'd gone through two fiancees. Samantha never understood how Cecily could make money matching up beautiful people in L.A. but when it came to her own love life she couldn't seem to get it right. Like you're doing so well? Touche, she told her snarky self. "You're enough to make a woman give up on love," Bailey muttered as she nodded and smiled at old Mr. Nilsen, who was ogling her from the other side of the hall. "That would be the smart thing to do," said Cecily. "Well, I don't think Mom's ready to give up on love. Maybe you could match her up with someone," Bailey suggested. "No!" Several people turned to stare and Samantha downed a slug of punch in an effort to put out the fire in her cheeks. What was wrong with her? Could a woman suddenly get Tourette's at thirty? The wicked in Cecily's grin turned up a notch. "I know No one will ever be able to replace Waldo." "I liked Waldo, I really did," Samantha said. "But no more men.. I've got enough to deal with already." "Gosh, Sammy." Bailey frowned at her. Samantha frowned back. "Hey, baby sister, you two get to go back to sunny California and match up lonely millionaires and cater events for starlets. I'm the one left with the fallout here." Cecily sobered. "I'm sorry. You're right. We're leaving you with a mess. You've got the business to sort out plus Mom's affairs." "Except if anyone can do it, you can, Sammy," Bailey said, linking arms with her. Samantha sighed. As the oldest it was her job to be the rock everyone leaned on. Except right now she didn't feel like a rock. She felt like a pebble on a beach about to be swept away by a tsunami. And her own mother had been the one to unwittingly drop her there. She and her mother loved each other dearly but they often locked horns. And right before Waldo died they'd locked horns a lot, especially when Samantha would try and get her mother to talk sense into him. "He's not feeling well," Mom kept saying, but when pressed for details she'd remained vague. Maybe the poor guy's heart had been acting up all along. Maybe he'd been so worried about his bad health he hadn't been able to concentrate and that was why he'd been making such poor decisions. Except that didn't explain his odd purchases. Or the answers he'd given her when she asked him about them. "A man needs to be able to protect what's his," he'd said when she'd asked him about the gun. "In Icicle Falls?" she'd countered. The biggest crime they'd had all year was when Amanda Stevens had keyed Jimmy Rodriguez's Jeep after he'd cheated on her with another girl. And Jimmy had decided not to press charges. "You never know," Waldo had hedged. "I saw someone. In the parking lot." "He was following me. And don't tell your mother," he'd added. "I don't want to worry her." Like he'd just worried his stepdaughter? Then there'd been the water. "We could have an avalanche and be trapped here for days," he'd said. She'd let that slide, too. Until things started going really bad. And then, just when she'd decided she and her mother were going to have to have a very unpleasant conversation, Waldo had walked from their house on Alpine Drive into town and keeled over dead right in front of Lupine Floral. Poor Kevin had dropped the roses he'd been storing in the cooler and run right out to give him CPR while his partner Heinrich called 911, but Waldo was dead within minutes. And now Samantha was left to deal with the mess he'd left behind. Her sisters were leaving on Monday and it would be just her left to deal with her mother and find a way to pay the people who depended on Sweet Dreams for their livelihood. Great Grandma Rose, who had started this family business on a dream, was probably turning in her grave at what her bozo descendants had done to it. Samantha frowned at her empty punch cup. The glass is half empty… the glass is half full. Either way, "This stuff needs booze." 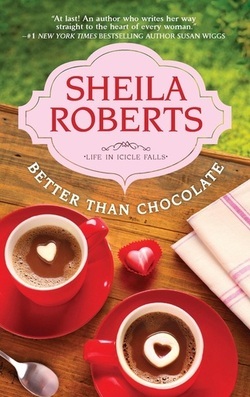 Better Than Chocolate is available online and in local bookstores.